It wasn't always so easy for Bonnie to command the roar of the crowd. 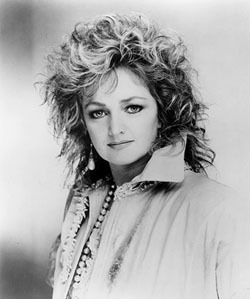 Years ago, one could've been forgiven for asking, Whatever happened to Bonnie Tyler? or Wasn't she the girl they dubbed 'the female Rod Stewart'? Best known for It's A Heartache and Lost In France, the two sultry mid-'70s singles which both hit top 10 in the U.K. -Heartache hit RIAA gold at #3 in America - she unfortunately got tagged by the public as a mom 'n pop act, unfit for rockers, which didn't please her one bit. So when her old management contract expired in 1981, Bonnie chose a new route. She rejected the idea of re-signing and pursuing the country audience she'd won in America. She wanted to rock. Faster Than the Speed of Night (May, 1983 U.S. release) was the result, featuring songs by Steinman himself, including the title tune and the massive single, Total Eclipse of the Heart which spent four weeks at #1 and passed RIAA gold to the verge of platinum that autumn. Classic material came from the pens of John Fogerty (Have You Ever Seen the Rain?); Bryan Adams (Straight From the Heart); Frankie Miller (Tears); and a raunchy version of Blue Oyster Cult's Goin' Through the Motions written by BOC's Eric Bloom and Ian Hunter of Mott the Hoople. Musicians assembled for the sessions in New York City included drummer Max Weinberg and Steinman's co-arranger Roy Bittan on keyboards, both from the E Street Band; guitarist Rick Derringer; Larry Fast on synthesizers; and Jimmy Maelen on percussion; not to mention the Letterman house band on It's a Jungle Out There. It was all topped and commanded by Bonnie's throaty, roaring, sensual vocalizing. She was finally a real rocker with a platinum LP to her credit in the U.S., South Africa, Sweden, Australia, New Zealand and Switzerland. It hit gold in the U.K. and France, diamond in Norway, and silver in Denmark and Greece. Not bad for this little girl who was raised just outside Swansea, Wales and started her career as a teenager singing six nights a week at local clubs. But she's never been the one to rest on her laurels; now the lull is over and the storm is about to break, and it's called SECRET DREAMS AND FORBIDDEN FIRE. And songwriting continues strong as ever. Desmond Child (of the band once known as Desmond Child & Rouge) contributed two compositions, Lovers Again and the aforementioned new single, If You Were A Woman (And I Was a Man). There's a new Bryan Adams/Jim Valance track, No Way to Treat a Lady. And Todd Rundgren duets with Bonnie on another Steinman number Loving You's a Dirty Job But Somebody's Gotta Do It, an earlier single release in England. As the new album and single are unleashed, rehearsals get underway for a global tour to promote them, starting in the U.K. late-May. Bonnie and Jim are also teaming up again to work on videos for the album. We really enjoy working together, enthuses Bonnie. A sure sign-a star is born. Bonnie Tyler: self-explanatory.